The map at right shows the favorable location of the Peters farm: near the southeastern tip of Chariton County, where the Chariton River flows into the Missouri. Farm products could be shipped to external markets by train from almost adjacent Lewis Mills, or by train or steamboat from Glasgow, the nearest town. 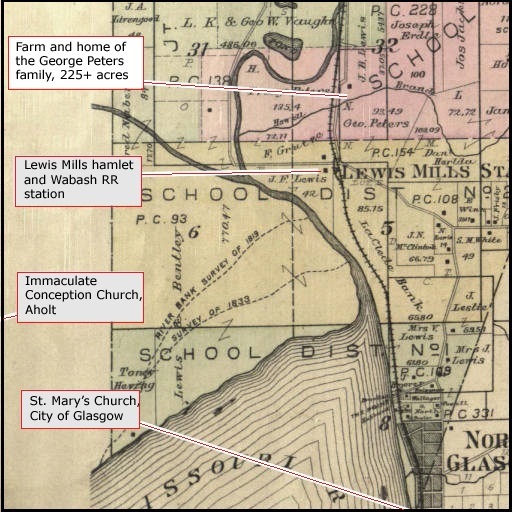 The farm lay two miles north of St. Mary's Church in Glasgow, two miles northeast of Immaculate Conception Church in Aholt. The Chariton River was the dividing line between the two parishes. Source: Plat Book of Chariton County, Missouri, 1897. Theresia Peters and five of her sons migrated from Sythen, Münsterland, to Glasgow, Missouri, in 1888. The eldest was George, 25 years old, who had become paterfamilias, head of the family, when his father died. Then came Henry (20) and Hermann (18). The youngest were Fritz (15) and John (13). In 2016, Carol Krueger, George’s great-granddaughter now living in St. Louis, kindly offered me scans of some letters Fritz and John sent home between 1894 and 1900, when they were away studying for the Catholic priesthood. This was at the start of careers in the church that would lead to Fritz founding the Catholic colony of Glennonville in Southeast Missouri, and to John founding the parish of St. John the Baptist in South St. Louis. I leapt at Carol Krueger’s offer. Theresia Peters’s sons were my great-uncles, her daughter Theresia my grandmother. These letters have not likely been read since a hundred years ago. I arranged for translation of the Old German script into modern German, and then into English. The paragraphs below report five insights the letters yield into the mentality and culture of the two seminarians and their family. “Blest be the tie that binds our hearts in Christian love” – so begins a classic hymn. The main meaning of Fritz’s and John’s letters is maintenance of the tie that binds an absent son to his family at home. In our time, children away at school keep in touch by phone, email, and social media. In the late nineteenth century, painstakingly written letters served the same purpose. There is the home folks’ standard plea: “Let us hear from you, so that we know you’re safe.” And the child’s standard response: “I’m fine, thanks, how are you” – and then a little news. Here is 20-year-old Fritz on January 4, 1894. He had by then completed his college studies at what is now Quincy University, across the Mississippi in Illinois, and was studying theology at Kenrick Seminary in St. Louis. As was the norm, he had spent the Christmas holidays at home. So had John, two years younger, who was just beginning his studies at Quincy. The two boys appear to have travelled together on the Wabash Railway as far as Moberly, where John got off to catch the train to Quincy, while Fritz continued on to St. Louis. I arrived here yesterday evening at 7 o'clock healthy and safe. I found all my friends in a state of health that leaves nothing to be desired, also cheerful and merry. Changes have not taken place during my absence. Just now I was informed that a priest had gone to New Orleans. He was not a teacher, but the business manager of the seminary. He was a very good man. It is doubtful that the one who will replace him will be just as good. Hopefully you have already recovered like me, from the distress of separation. I left John cheerful in Moberly. Hopefully, he does not suffer from homesickness, although he, like me, will feel slightly blue for one or two days. Now I will close for today, since I have nothing new to write in the hope that this letter will find you in the best of health. Greetings to the Westhues [his sister Theresia’s], Peters, and Riddermann [George’s wife Anna’s] families. Since this letter is still not sent, I will add a few more words. Everything is now again running on its proper course. I feel again completely at home. Dear Hermann! I'd be very happy if you would send me the flute. Wrap it very well so that it will not break due to rough handling by railway officials on the journey. In similar reinforcement of the family ties that bind, here is 25-year-old John writing six years later, on January 29, 1900, from Kenrick Seminary, after spending the Christmas holidays in Glasgow. He had visited not only George and Anna's home, but also that of his sister Theresia Westhues a few miles east. His mother normally lived in her eldest son’s household, but both she and John appear to have been staying with Theresia’s family when he ended his visit, leaving for a trip to Boston and then back to the seminary. As mothers do, John’s mother fretted about him riding off to catch the train, while he seemed to think she fretted too much. Although only three weeks have passed since I was with you, it seems much longer, as though almost a lifetime has passed. That is because I was unable to say good-bye to you, also because I liked being there so much. I wanted to speak to you on the 7th of January, but the rough roads prevented me. I had saddled the horse already at 7:00. My mother said it was not possible, that, in addition, she was expecting you in the afternoon, when the roads would be better. Yes, Mother also believed, because I wanted to be so early and absolutely in Boston, that the bridge might collapse there, or that I would fall off the horse, or that I would meet something. Now I am sorry that I did not get there. The fact that Fritz and John were following vocations to a white-collar profession requiring little physical work but yielding much higher status than farming did not imply disinterest in how their brothers were making a living. Farming was the family’s way of life. Farm Income paid a substantial part – the letters do not say how much – of the boys’ tuition and living expenses at school. Small wonder that references abound in the letters to crops, livestock, and farm equipment. I have received your letter in the best of health and I am very happy that you all are quite healthy. It also pleases me that you are looking forward to my arrival – which, when I consider the weeks of June, is already just around the corner. Hopefully, as you have written, the wheat harvest will be good. I am already looking forward to seeing the thick and heavy sheaves fall one after the other from their self-binders. If only the wheat would fetch a decent price! Hopefully your corn will also develop well, so that you can expect a rich harvest. I have just now received your dear letter. You are so much more ahead with the work than you were last year. ... Hopefully I can help with the wheat harvest. Here, it is still not quite as far as Hermann writes it is with you. We will get the rabbits in the pan, but the sly fox already knows how to protect itself. We must also not forget the fishing, as it will probably be better this year, because now everything seems to succeed. Now I want to close my letter, but I want to write another one so that I do not have to wait, because a letter could always get lost. An old joke points to a major topic of letters exchanged between children away at school and their parents. Boy to father: “No mon, no fun, your son.” Father’s reply: “Too bad. So sad. Your dad.” Fritz and John’s mother and brothers were more compassionate and generous than that, regularly sending money and packages of goodies. Mr. Fortmann [neighbor in Glasgow] seems to have made his last trip in a terrible King-Duke coach [an upscale type of closed carriage named for King William IV of England). The biggest damage is not the wrecked carriage, but that even the horses are ruined. It is strange that there are so many fires in Glasgow. The best is it usually hits those who do not become poor as a result. I am pleased that you have bought a donkey, now especially, when you have the opportunity, so that you have it when it gets hot. The weather here is excellent, so warm that nobody needs an overcoat. Because I also would like to go out in this beautiful weather, I would like to ask you, if it is in your power, to send me some money for a new jacket. I have inquired about prices and found out they are really expensive. I was told that if I wanted something worthwhile, I would have to pay at least $18 at the store [about $400 in 2016 dollars – ready-to-wear clothing for men was available by this time], at the tailor’s much more. If I have only one, then I do not care about the price or the beauty of it. Also, I need some summer undervests and socks for a pair of shoes. My dear mother and brothers, it really hurts me that I have to ask for so much money, because I am well aware of your lack of money and your own needs. I would gladly do the hard work, but I see well what is necessary for my status. Now I ask you again to send me some money at your discretion. I have also received a letter some time ago from Boston, written by Anna [probably Anna Fuemmeler, an orphan the Peters family had taken in]. Anna writes a beautiful letter and I am happy every time I read the letter. I'll answer it soon. Finally, I hope that this letter finds you in the best of health. Looking forward to your fast reply!!! It would be very happy, dear Hermann, if you would send some money as soon as possible, because I need it currently very urgently. For quite some time, I have been completely broke; and I have already for a long time remained home on Wednesdays while the others went out, just because I couldn’t afford to use the streetcar, as is usually done. Since, in addition, I had a rather strong fever today, some money for quinine or lemons would be welcome. I am now very weak, yet I'm otherwise pretty good if the fever does not show up again. I have received the zwieback [or rusk, sweetened bread that is then toasted, so that it lasts well], which is already long since gone. To the question why the two youngest Peters boys both felt called to the priesthood, a partial answer may be the apparently close relationship the family formed with a priest named Anton Pauck, who was pastor of St. Mary’s Parish in Glasgow when they arrived, remaining there until early 1891. Catholicism had a mainly Irish character in the American Midwest in the nineteenth and early twentieth centuries. Germans were an ethnic minority, almost a church-within-the-church. They lived, for the most part, in self-segregated rural and urban neighborhoods, where German was the main language spoken. The (mostly Irish) bishops appointed German pastors to tend to these hyphenated Americans‘ spiritual needs. In Missouri’s largest city, St. Louis, so-called “national parishes“ were established for German immigrants as well as for those from other non-English-speaking ethnic minorities. The parishioners of St. Mary’s in Glasgow were not all German but mostly so, and for this reason, a German pastor was ordinarily appointed to this parish. Father Pauck was one of these. When he was transferred in 1891, it was to found a new national German parish in north St. Louis, St. Englebert’s. That is where he was stationed from 1892 to 1900, when Fritz and John were students at Kenrick Seminary in the same city. It is telling that among Fritz’s and John’s letters that have survived all these years is part of one written not by Fritz but to him. The writer was Father Pauck. It is the earliest letter in the collection. Its dateline reads St. Louis, Mo., March 13, 1891. This was just after Pauck‘s transfer away from the Glasgow parish, while Fritz was still at home on the farm. This letter, I suspect, was considered a family treasure, a tangible sign of the close relation Father Pauck had formed with Fritz, whose consequences would be lifelong and extend to everything that Glennonville came to be. It is now almost three weeks since I had to bid farewell to you. Of course, I would have liked to stay in Glasgow, but I think it should be as it is. I do not want to omit giving you a little sign of life from me. More than once I thought of the pleasant hours I experienced when we translated the Sepo together. You must not laugh at me, when I tell you that I miss you. How are you then? I am unsure to what text the word Sepo in Father Pauck’s letter refers. It may be short for Septuagint, the classical Greek version of the Old Testament. Translating Latin or Greek ecclesiastical texts is the kind of common task in which a fatherly pastor and an eager boy with clerical aspirations might happily engage. Money may have had something to do with Father Pauck’s relation to the Peters family. Might he have subsidized Fritz’s and/or John’s seminary schooling? I do not know. The only bit of relevant evidence is an undated letter from Fritz to George, his elder brother. Fritz was a seminarian at Kenrick, which dates the letter between 1894 and 1898. Today I took care of your wish and went to see Father Pauck about finances. He told me he will gladly lend you the money and would have done so earlier. He asks me to inquire how much you want and for how long. He says he lends it out at 4 or 5 percent. Regarding security, he was already convinced and not afraid. Since we are off on Thanksgiving on November the 30th in the afternoon, please write back as soon as you receive the letter, so I can inform Fr. Pauck. Should you receive the letter on Sunday, write back straightaway in the night, so it’s here early enough. I don't like to ask for permission to go out, because they are very strict in this regard. This morning I have, however, received permission immediately. Please greet Mother, brothers, the Westhues and Riddermann families. It is now nine o’clock and time for bed. The most surprising document in the collection is a rambling missive from John dated January 29, 1900. Fritz was already ordained by then, as John would be two years hence. The “brother” in the salutation is George, the “sister” is his wife Anna, “mother” is of course Theresia, and the “grandchildren” are George and Anna’s offspring. The two other brothers, Henry and Hermann, were probably living on their own by this time. To understand John’s musing about his future, it helps to know that the Peters home lay just east of the Chariton River, placing the family by canon law in the Archdiocese of St. Louis and its local parish, St. Mary’s in Glasgow. The community the Peters family was part of, however, German Catholics farming the rich bottomlands, lay mostly on the other side of the river, which was part of the Diocese of St. Joseph and its local parish, Immaculate Conception. This parish had its own pastor, appointed by the Bishop of St. Joseph. Its small, frame country church in the hamlet called Aholt was two miles from the Peters home, the same distance as St. Mary's Church in Glasgow. This location mattered to a bright, ambitious young man contemplating life as a priest. St. Louis was then the fourth largest city in the United States, a rich, burgeoning, cosmopolitan metropolis preparing to host both the summer Olympics and a World’s Fair in 1904. St. Louis was where the action was. The archdiocese covered half the state, of course, which meant a priest could easily spend his whole life in out-of-the-way small towns, but he could hope at least to be assigned to the cathedral city. The Diocese of St. Joseph, by contrast, was small and almost entirely rural. Nothing about its cathedral city was world-class. Relative to St. Louis, it was the boondocks. From all the correspondence I have reviewed, it is plain that Fritz and John Peters were oriented to St. Louis as opposed to St. Joseph. They wanted to move up in the ecclesiastical world. There is no hint anywhere of interest in studying for the Diocese of St. Joseph. Indeed, as the letter below shows, John’s worry was that even in the Archdiocese of St. Louis, escape from the countryside was by no means guaranteed. By the way, I might just as well have left my spirit in Boston and died there without any legacy as dying later in the “Missouri backwoods” [John writes this phrase in English, the only English words in these letters] in some bleak farming community. I'm talking about "backwoods,” where else should the bishop put a onetime farmer? You know what Bishop Burke [of St. Joseph] has done with a onetime coachman [the pastor at Aholt, presumably]. That is also right. I do not want to agitate against your pastor, just now his dignity is big, whether he is in the City of Aholt or the Cathedral of New York. Our Professor said the other day, "Boys, in the world [that means outside the clergy] there are many bigger minds and talents than there are in the priesthood." I have known this for a long time, and have often wished that others had my profession and I could take care of theirs in the world. Also you, Brother, have better abilities than me to be a pastor. But again, this lies in God’s hands. He does not need help to carry out his will. The close relation between the Peters family and Father Pauck apparently did not extend to his successor, John Waeltermann, pastor of St. Mary’s from 1897 to 1915. The last line of John’s letter relies on a German proverb that describes sheep making lots of noise but yielding little wool. John apparently considered that there was much noise but little wool, much bombast but little substance, in Glasgow’s pastor at that time. Much of the content of these letters and letter fragments serves to remind us how little the most important things have changed over the past century or so. There were the same ties then as now binding children to their parents and siblings, ties nourished by messages exchanged over long distances. Youth then as now struggled to find paths through life, and relied on their families for financial and emotional support in this process. Then as now, their futures were shaped by adults – pastors, teachers, neighbors, as well as kin – who took an interest in them. The letters remind us also of how much has changed. In transport, from horse and rail to car and plane. In agricultural technology, from binders and donkeys to robots, drones, and computerized harvesters. In medicine: quinine helped conquer malaria, so that by now, few people in the developed world encounter either one. The biggest change between then and now is one neither Fritz nor John (mercifully) lived to see: the near collapse in America of organized religion, Catholicism in particular, since the 1960s. When those two boys were deciding on their careers, becoming a priest was a standard, respected option. The clerical profession was taken for granted as a normal, indeed essential part of society, no less than medicine, law, commerce, or farming. By now, it has lost legitimacy in our increasingly secular, even anti-Catholic culture. The priesthood continues to be valued in the dwindling minority of churchgoers, but not much in the mainstream public order. John comes across in these letters as feistier than Fritz, less reverent. Ironically, while it was John who worried about spending his life in the “Missouri backwoods,” it was Fritz who ended up doing so. Fritz was left to shepherd the farm community of Glennonville, with its small frame church, until he died. John, meanwhile, oversaw until his death the large, rich, vibrant parish he founded in the cathedral city. By all accounts, he managed it well. He is said to have told the Archbishop of St. Louis, “You run your diocese and I’ll run my parish.” Still, it was Fritz, not John, whom the Archbishop honored with the title of Monsignor in old age. I am grateful to Carol Krueger of St. Louis, Missouri, for providing me with scans of the original letters. Thanks also to Elisabeth Bailey of Limburg/Lahn, Germany, for transposing the Korrect script into modern German, and for assistance with translation into English. Responsibility for the final English version presented here and for my commentaries rests entirely, of course, with me.